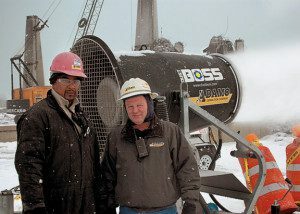 The DustBoss® 30 (DB-30) is the most compact of the DustBoss family of fan-driven dust suppression equipment, capable of covering half of an American Football field in light mist using just a standard garden hose. Standard 70° oscillation coverage: 5,500 square feet (511 square meters). Optional 359° oscillation coverage: 31,000 square feet (2,880 square meters). Water usage: 1.4 gpm (5.3 lpm) to 2.8 gpm (10.6 lpm). Endless remote / automation capabilities.